Featuring an extra long 24" barrel for improved accuracy, power, and range, this version of the ever popular Crosman 2250 is one of the most popular CO2 air rifles on the market today. This Night Hunter kit also includes a quality Hawke Vantage 3-9x50 scope, a Pellpax Micro Superlight, a Pellpax Sound Soaker Moderator, a Plastic Bipod, a padded gun bag, and a tin of pellets. Everything you need to start shooting as soon as you get it. The longer barrel not only improves accuracy, power and range, but also distributes the weight much more evenly across the rifle as a whole. When it was chronographed by our on site gunsmiths, an extra ft/lbs was gained, putting this rifle right up in the 11ft/lbs range, just below the legal limit and more than enough to finish off the majority of pests and garden vermin with one shot. 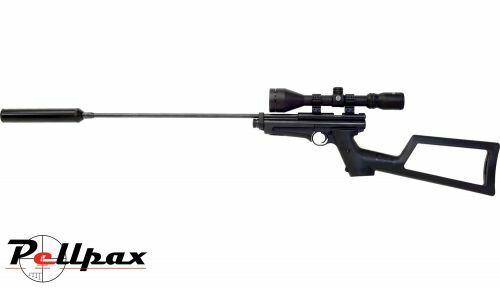 This is the ultimate air rifle for pest control, target shooting and general plinking.